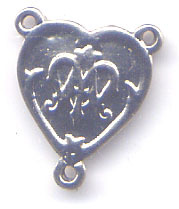 Beautiful shiny ornate Heart with the Ave Maria monogram. Smooth shiny back suitable for engraving a date. A St. Joseph's exclusive! Made of hard, lead-free pewter in the USA.